If your website is like many I have seen, you get a fair amount of daily visits and unique visitors, but it may be the case that a large number of your visitors don’t go beyond the first few pages of your site. When I see this, I get very frustrated when I think about all I have done to get people to my site and optimized the site for my designated conversion goals. But as web analysts, we need to put our emotions to the side and get down to the numbers. Therefore, one of the things I like to do is to quantify how big of a problem my website has with visitors who only view a small number of pages. In this post I will show you how to quantify this so you can begin to take action on addressing this issue. 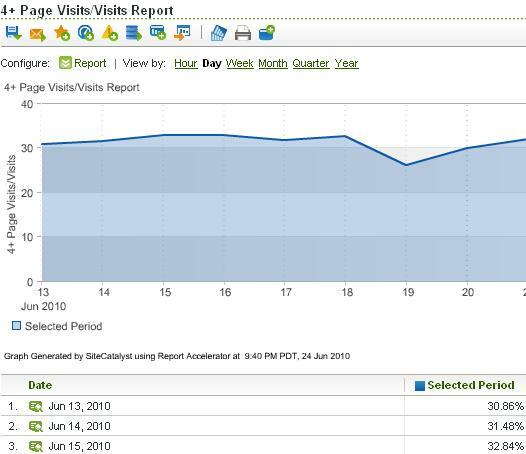 As you can see in this funnel, there is a pretty significant gap between Visits and Form Views. While that presents a huge optimization opportunity, I like to break massive efforts like this into smaller chunks that I can work towards (or as Avinash points out – Micro-Conversions). Since we noted earlier that a large portion of visits exit after three pages, wouldn’t it be nice if we could bridge the gap between our Visits metric and our Form Complete metric in the funnel above? Having a middle ground between these Visits and Form Views might get our team to think about ways to turn more Visits into Visits of four pages or more which, depending upon your site, might be a step in the right direction. In many sites I have worked with, there is a direct correlation between visitors viewing more pages and higher form conversion rates. Now that we have set-up the situation,it becomes a bit easier to understand what I mean by “X+ Visits” since I am really saying that you can set a new Success Event metric which represents how many Visits your website gets where the visitor viewed more than “X” Pages. What “X” represents is up to you and should be based upon your own data. 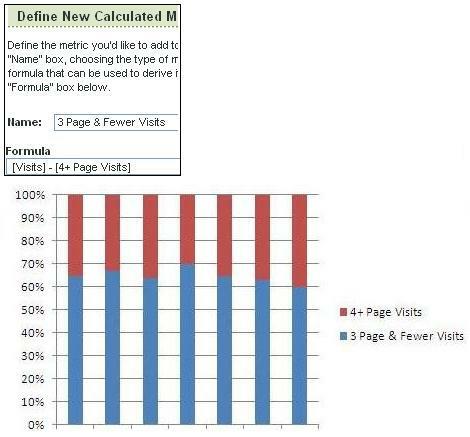 In this example, we will say that we are going to call it “4+ Page Visits” meaning the number of Visits in which Visitors viewed four or more pages. There you have it. If you find that you consistently have significant website drop-off after a few pages, hopefully, this new metric will help you better dissect what is happening so you can “Micro Conversion” your way to more Macro Conversion! A quick thought: the trick to implementing this is to code the script to set the Success Event after X+ visits. And ideally, it would mean using Omniture’s definition of “visits” to ensure that there’s no difference in how the X visits are detected vs what SiteCatalyst reports itself (e.g. with the Page Depth report). If that visit methodology is a secret, then this could be something that Omniture Engineering should develop, not the website owner.